Commissioned in April 2017, the 60 MWp First Toledo Solar Energy Corporation (FTSEC) PV Power Plant, as a wholly owned subsidiary of renewable energy company, Citicore Power, Inc. (CPI), is located in Barangay Talavera, Toledo City, Philippines, and is considered the largest solar power plant on Cebu. 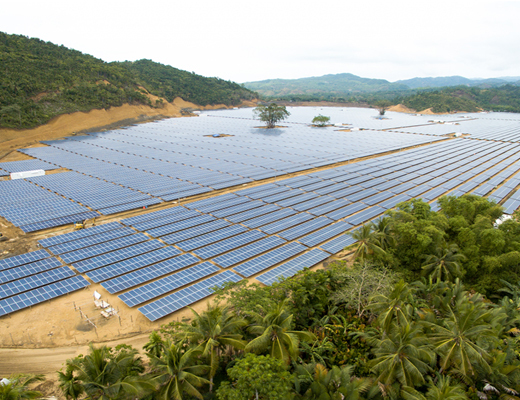 The Citicore Toledo 60 MWp PV Power Plant’s 193,440 modules produce about 83,846 MWh of electricity per year, supplying over 50,000 Philippine homes and offsetting 46,923 tons of CO2 emissions annually. On July 6, 2017, FTSEC was awarded Certificates of compliance (COCs) to operate 60MW PV Power Plant after complying with all the necessary permits and requirements for power generation facilities. “These COCs enable our two solar plants in Bataan and Cebu to generate electricity that will serve the people. This is in line with one of our goals to become a compliant company that cares for the environment,” said Manolo T. Candelaria, CPI executive vice president for Commercial and Development Operations.